Any WordPress user who has been blogging for more than a few days understands how important social media is as a tool for growth. You should use your social media profiles to drive people back to your blog, and by the same logic, you should also drive people to your social media profiles from your blog. After all, any new follower becomes someone who you can interact with time and time again. With that in mind, in this post I want to take an in-depth look at the myriad ways in which you can promote your social media profiles via your WordPress blog. As you would expect, there are a number of different plugins available — some good, some bad. I have cherry picked a selection of the best and most unique plugins available. So now it’s just up to you to decide which one best suits your blog! 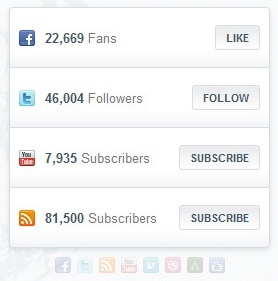 Weighing in with well over half a million downloads, there is no doubting Social Media Widget’s popularity. I’m not going to list every single social media site that is supported by Social Media Widget, but you can certainly get a sense of scale from the number of icons displayed above. It offers what one might consider a more professional look, with pretty nifty mouseover effects (which you can see in realtime in the footer of this site). As you can see, this plugin offers a highly graphical social promotion experience. If you’re after something that stands out a little more than say Social Media Widget, this is a good option. This is the first of two premium plugins in our roundup today, but its inclusion is definitely worthy (not least because it will only set you back $4). As you are no doubt aware, social proof can be enormously valuable in boosting your reputation in the eyes of readers, and it also serves to increase your conversion rate. In broad terms, if someone sees that you have 1,000 fans, they’ll be more likely to follow than if you only had 100. The benefits of using a plugin such as this are pretty straightforward — if you have a high fan/follower/subscriber count, more people will sign up when they see your impressive numbers. This plugin is highly customizable — from the colors, to the icons, to what is actually displayed. There is also a premium version, with a whole bunch of extra features like additional sharing buttons, more icons, more color options, and so on. That’s all there is to it — a bar that runs across the top of your site. And yet, it has been proven to be very effective in attracting clicks. You can put a link up there to whatever you like, and you’ll be rewarded with a relatively healthy click through rate. You can even use it to display your Twitter feed. Hello Bar is a freemium product — it is free to use with up to 25 clicks per month (which admittedly isn’t going to get you very far). If you do decide to fork out for the pro version (with prices starting at just $4.95 per month), you can take advantage of the natty A/B testing, which means you can optimize the copy and style of your Hello Bar to get the best possible click through rate. What’s Your Favorite Social Media Profile Promotion Plugin? The six plugins plugins above represent what I consider to be the best options available for WordPress. Do you use one of them? Or do you have a preferred alternative? Or do you not use a social media profile promotion plugin at all, and if not, why? Tell us in the comments section — we’d love to know! Even the post is over 1,5 years old, it provides useful info on the WordPress social media profiles plugins. WordPress plugin is one of the essential requirement for wordpress blog or website. Great, I really like your post.